In our cold northern Indiana climate, raising pet rabbits in the winter presents only a small challenge. 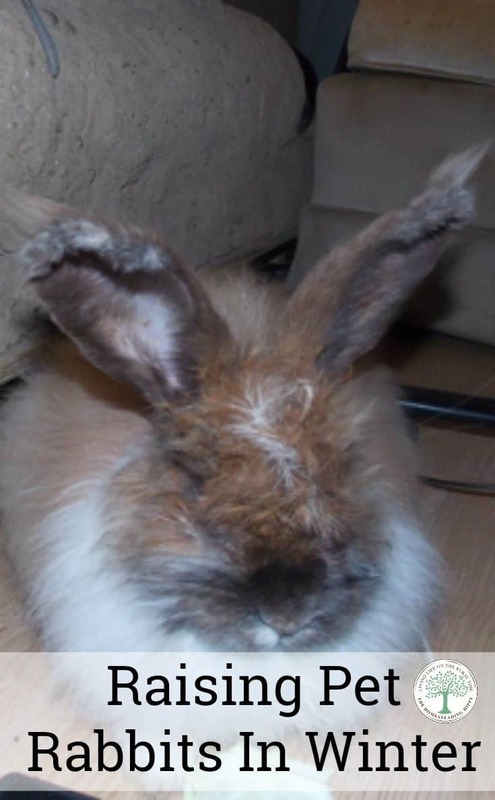 Our pet rabbits range from Havanas, LionHeads, to French Angoras, all different types of rabbits that have lots of hair. As a matter of fact, it’s harder to keep them cool in the summer! What do I do about water freezing for my pet rabbit? You can use heated water bottles like these. Purchase each rabbit 2-3 water bottles, and place one on their cage. Store the others inside where it’s warm and allow to thaw. Throughout the day, simply exchange the bottles for unfrozen ones. Quick and easy, and sure beat trying to run them under hot water to thaw! 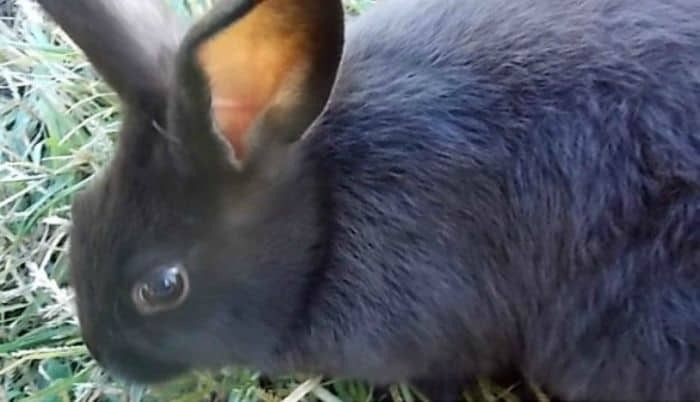 Does my pet rabbit need hay in the winter? Pet rabbits actually need good quality hay year round, it can be more important in the winter. Why? Adding in a handful of fresh hay 2 times a day gives them a place to “hide” under it if they got chilly, and munch to their hearts content. What does my pet rabbit need to eat in winter? Good quality food is a must at all times. Rabbit do expend more energy keeping warm in the winter, so you may find they need more food. Usually, it’s recommended to have an 18% protein feed for domestic rabbits. The occasional treat of oats, an apple slice, banana, or sweet potato should be rare. Rabbits blood sugar can increase faster in the winter, and cause a problem. How can I keep my rabbits warm in winter? Wild rabbits live outside all year long, and simply dig a burrow to crawl into to keep warm or cool. 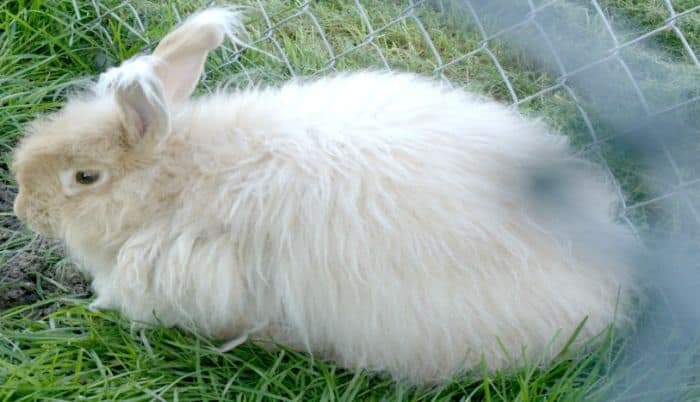 Pet rabbits can live outside, but need to be protected from the elements. 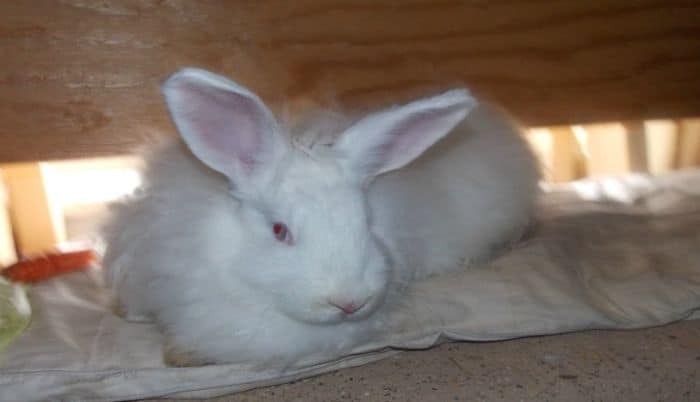 Provide a hutch, a covered cage, or a barn for them to stay warm. Pet rabbits need to be draft free all the time, but in the winter, it’s crucial. Continual cold drafts can make an entire herd sick quick. If your rabbits are in a closed barn, make sure they can still get fresh air. Keep the door closed up to 90% of the time to keep out cold drafts, but still allow air movement. How do you raise your pet rabbits in winter? Are they inside or outside? I’m curious to know about your cleaning technique in the winter. It can drop down to -50 Celsius here and I’ve got 2 two does and a buck in a wooden and wire hutch outside. For the most part the cage stays clean because of the wire bottom but there is a bit of wood in each cage that is exposed to pee and droppings. Obviously I can’t hose that down when it’s below freezing so any suggestions as to what I should do? Is it ok just to wire brush it off or should I be moving them out of their hutch and taking hot buckets of water out and washing it down? This is my first winter caring for them and I’m feeling a bit nervous about keeping them clean and happy in their hutch all winter long. we have outdoor cages that are bigger that we use for nice weather with wire bottoms so the poo just drops through. But when the weather turns nasty the bunny go in the shed. WE have wire cages with collection tray under them in the shed. We put shavings in the trays to soak up urine and help control odor. I have the girls pull these out once a week and put in new shavings. We don’t get -40 (burr, makes me shiver just to think of that). I would think the urine would just freeze and odor would not be an issue. We do get -10 sometimes. But we just wait for a nicer day (during the winter that would be a zero degree day or slightly higher) and then bundle up and go out and clean. I think the tip is to have the right clothes. We have a coat rack and have ski overalls on in and just slide those over our clothes. And we have a box with face masks and gloves. My girls are 10 and 13 and they don’t mind the cold with the right clothes.